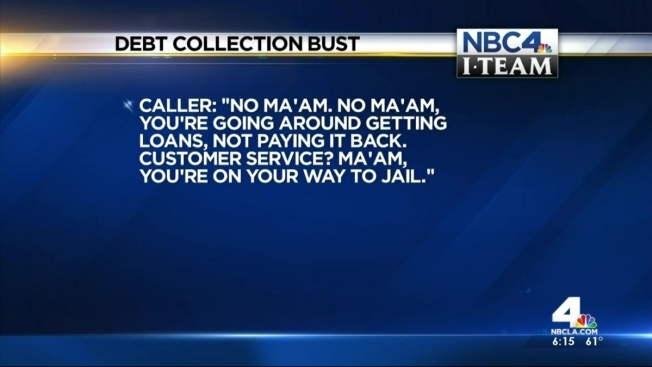 Seven people have been arrested for running a debt collection scheme that tricked and intimidated thousands of American consumers, and their dirty tactics are caught on tape, federal authorities said. The bust targeted a Georgia-based debt collection company called "Williams Scott and Associates," and victims include people in all 50 states, including California, the United States Attorney's Office said. Investigators say workers called more than 6,000 people who owed money, and pretended to be part of a federal task force. Consumers were bullied and told they'd be arrested if they failed to make immediate payments, authorities said. Victim: OK, at this moment right now I’m not working. Caller: OK, well see with that being said I will have no choice but to forward it to Los Angeles County. However, Los Angeles County will issue you with a warrant for your arrest, it will be for a depository check fraud as well as theft by deception. V: Fraud? How is that fraud if that’s not fraud? C: Depository check fraud because you did give them your personal checking information, along with the date as to when they can extract the funds to be paid back for the loan, they can come after you for a depository check fraud, and see that’s what happened. V: Is there, is there any payments that I can do? C: If you want to rectify it on a voluntarily basis, you’ll pay us. Now if we don’t get it taken care of with you voluntarily, at that time we’ll forward it to Los Angeles County. However, you’ll have to turn yourself in, and rectify it that way. C: I’m going to have them send you out a email, you either rectify it or you don’t, that’s the bottom line. And if you don’t just know that Los Angeles County will have you issued with a warrant for your arrest. While this company's been shut down, investigators warn that there are more of these shady companies out there that could prey on unsuspecting consumers. Law prevents debt collectors from pretending to represent the government, and to falsely claim that debtors have committed a crime. If you suspect you've been targeted by this kind of harassment, you should contact the Federal Trade Commission at 877-FTC-HELP.